Nepal has 2 major religions and over 50 different festivals. National days may follow Gregorian calendar dates, but most religious festivals follow the Nepali calendar, which operates on a lunar cycle. For a good compilation check here or here (the second ‘here’ has scheduled dates for 2013-14). Below are some key ones (and a few minor ones). Mid-January; Maghe Sankranti is a ‘solstice’ festival. People take an early morning bath in a holy river, worship Vishnu and present flowers, incense and food to him. Some rub mustard oil over their bodies, distribute and eat feasts of rice cooked with lentils, yams and sweets made of sesame and sugarcane paste. Mid or late January; this day is spent fasting and worshipping Ganesh and ends by feasting into the night. January to February; this festival is for the wish-fulfilling goddess Swasthani. During this period a chapter of the Swasthani scripture should be read every evening for a month. Devotees, go to the bank of Shali River, 40 kilometers east of Kathmandu, to participate in month-long fasting and prayers. Late January or early February; this festival is celebrated to welcome the spring season, on the 5th day of which people and dignitaries gather in Kathmandu Durbar (town square) and a band plays a traditional song. At the Swayambhunath and Nil Barahi temples (both in Kathmandu) there is a different celebration. Here people worship Saraswati, the goddess of learning, and artists, musicians, teachers and students bring flowers, unbroken rice and other gifts to please her. Traditionally children are taught to write their first words, Brahmins are fed, ancestor worship is performed, the god of love Kamadeva is worshipped and most educational institutions organize a puja (religious rite). People usually wear yellow garments, Saraswati is worshipped in a yellow dress and yellow sweets are eaten. Early or mid-February; Maghi Purnima is a full moon bathing festival in which bathers are carried in a procession on ornamented litters whilst lying on their backs with lighted lamps on their chests, arms and legs. Other bathers bear earthen water-pots on their heads, perforated with straws, through which water seeps down to sprinkle passers by. Traditionally the bathers wear green spectacles to protect their eyes from the sparks of the lamps they are in contact with. (Kathmandu Valley). Early or mid-February; for some Tamang and the Yolmo the New Year commences at the new moon and is celebrated with great fervour at Boudhanath, at Jawalakhel, in the Kathmandu Valley, and in relevant country areas. A fusion of dance, colour, music and feast, it traditionally lasts 4 days, though Tamang leaders are pressing for an extension because ‘we get tired from religious and cultural programmes of 4 days’ — must be a bid to hit more chang — barley, millet or rice beer — or spare days for a hangover. Early or mid-March sees the Sherpa New Year with a lot of partying, costumes, feasting, drinking etc. Celebrations are had at Bodhnath and in relevant country areas. On Shiva’s birthday (February) sadhus (holy men) from throughout the Indian sub-continent gather to visit Pashupatinath Temple (Kathmandu) and worship Shiva. 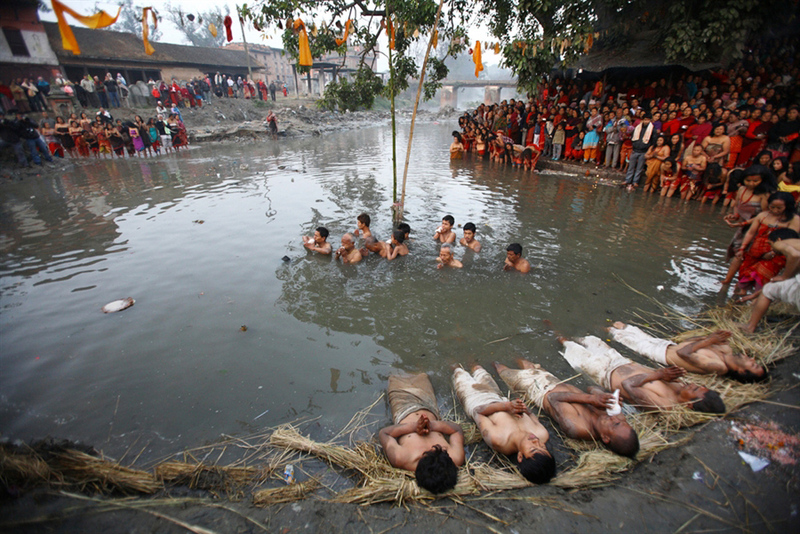 They bathe in the Bagmati River, rub ash over their bodies, give lectures to disciples, meditate and practice yoga. People light bonfires, share food with neighbours and friends and enjoy two days and a night of music, song, and dance. Maratika Cave, Khotang, eastern Nepal is a major pilgrimage destination. This is an extremely colourful festival. 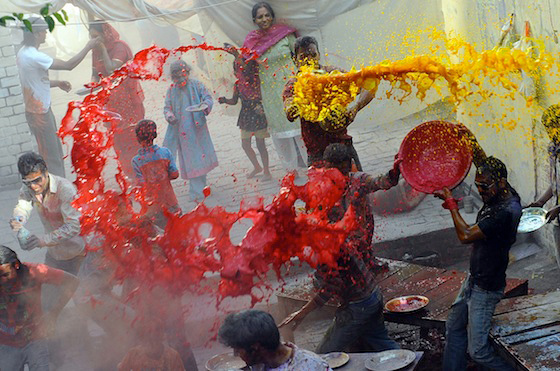 Mid or late March; this week-long popular spring festival of colours, is one of the most playful carnivals in Nepal. Holi culminates in a very wet way when, on the final day, people decorate you with coloured powder and chuck water over you — wear old clothes and keep your camera well protected. A lot of bhang is mixed into the food and drink — party time! During this festival, the Machhendranath, Nepal’s guardian deity and a god of rain and plenty, is bathed, oiled, perfumed and painted before being placed on a chariot and dragged by the toiling masses for 4 days through the narrow cobbled streets of the old city. The Living Goddess Kumari visits him at his elaborate temple near Asan Tol (Kathmandu) and if he is pleased by the music and offerings from his devotees the people of the valley can look forward to a satisfactory rainy season. Late March or April; Ram‘s birthday is celebrated all over Nepal and most people visit their local Ram temple to leave offerings. At the Janaki Temple, in Janakpur in the eastern Terai, there is a large festival with a procession of elephants and bullock carts and many visitors dance and sing in the streets. In Bhaktapur (Kathmandu Valley) people go to the River Hanumante to pay respect to Ram and Hanuman. The Nepali New Year (the second week of April); sadhus visit Pashupatinath Temple to take a dip in the holy Bagmati River and people go for picnics and celebrate the day socialising. 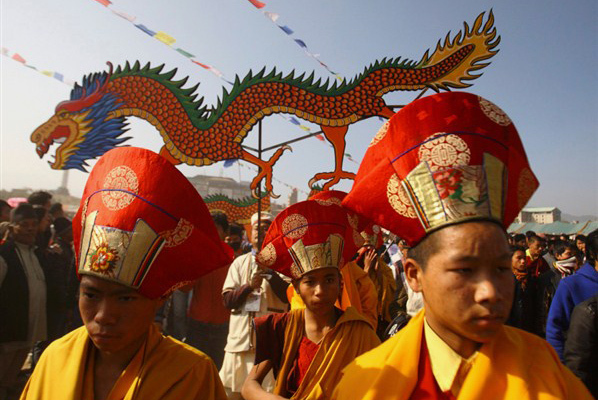 Overlapping the Nepali New Year a week-long chariot festival, celebrating the slaying of 2 evil serpents, takes place. Bhaktapur is the most spectacular place to be. Mid-April; during this week-long post-New Year festival a fire is burned in the vicinity of Bajra Jogini Temple near an image of a human head. An image of the goddess is placed in a wooden shrine and carried through the town by the men. (Kathmandu Valley). During April the Nepali army puts on a graceful performance of horsemanship, motorcycle feats and gymnastics in Kathmandu. According to legend this ‘horse festival’ was celebrated after the people buried a demon in the soil of Tundikhel showground and he may rise again if he is not trampled on by horses each year. The living goddess Kumari and thousands of people from all over the country take part in this festival. April; thousands of pilgrims keep an all night vigil at Swayambhunath Temple. The next day they trek to the 22 waterspouts at Balaju for a ritual bath. (Kathmandu). 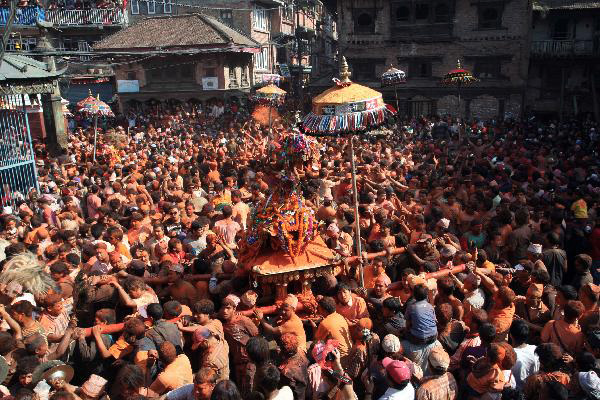 Late April to early May; a major 2 week chariot festival during which the Machhendranath is mounted on a huge chariot and slowly dragged by the toiling masses through Patan to Jawalakhel (both in the Kathmandu Valley). It is accompanied most of the way by a smaller chariot carrying an image of Jatadhari Lokesvara. The highlight of this festival is the ‘showing of the sacred vest’. In late April or early May Nepalis celebrate Mother’s Day. 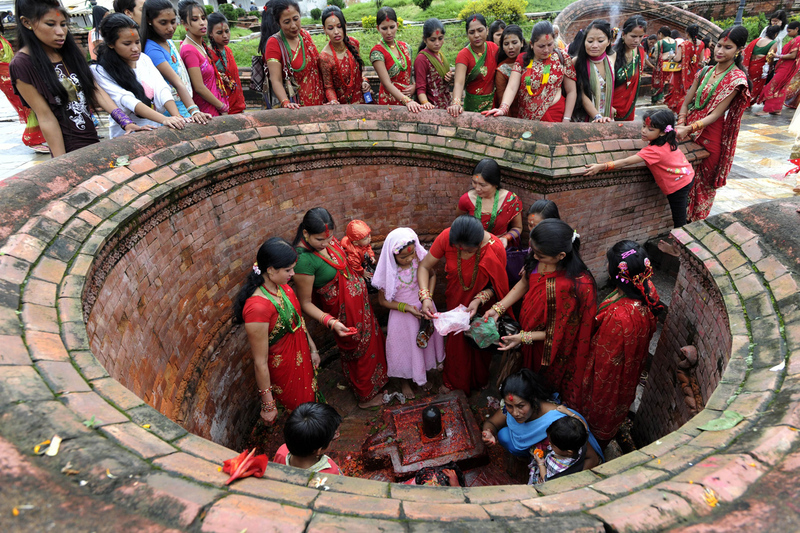 Many, whose mothers have passed on, invoke a Newar tradition of visiting Mata Tirtha, Kathmandu, in the hope of seeing the deceased mother’s face in the old village pond, or at the very least honouring her by going. The full moon day in May (sometimes late April) is the celebration of both Buddha’s birthday and his death. People reach the stupas before dawn, circle them and give offerings to the various Buddha images. The Hindu temple of Swayambhunath displays sacred thangkas and monks dance! This is a big day, with a large fair, in the religious centre of Lumbini, which is situated in the Terai. 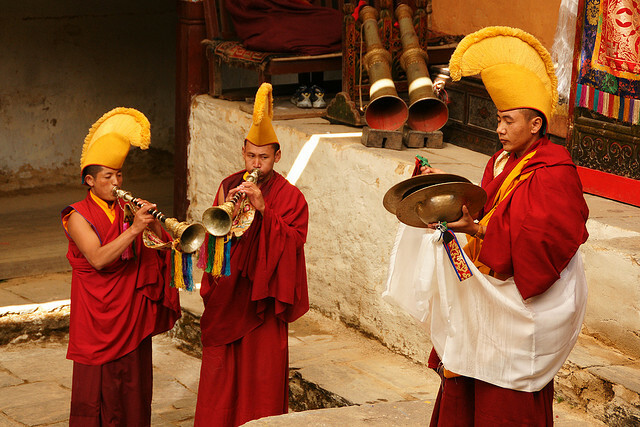 Late May; Teechi (pronounced “Teeji”) is an abbreviation of Tempa Chirim (Prayer for World Peace) and is a 3-day Tibetan festival celebrated in Lo Manthang, (Upper Mustang). 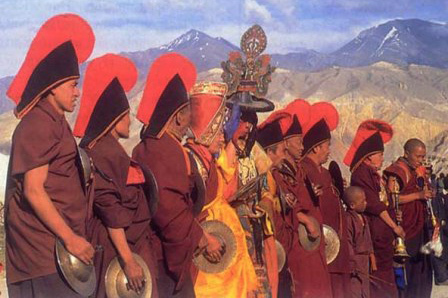 Dances are performed by the Sakya sect (Red Hat) monks of Lo Mantang’s Chhoedhe Gompa to commemorate the victory of Lord Buddha’s incarnation, Dorjee Sonnu, over a demon named Man Tam Ru, a vicious creature that fed on human beings and caused storms and droughts. Early June; the people feast and split into 2 teams (mainly children) to engage in a stone-throwing competition. Abducted opponents are no longer sacrificed to the goddess Kankeshwari. Mid-July; the 360-year-old 4 day Dumji celebrates and honours Guru Rinpoche’s birth and serves as a religious and community duty to help bring villagers together. Dumji is celebrated during July by the Sherpas in the Namche (Everest) region; especially Tengboche, Namche Bazaar (the most popular), Khumjung, Pangboche and Junbesi. Sherpas elsewhere, eg in Kathmandu and the Helambu region, also party and dance. Late July or early August; the first full moon of Asar is set aside for students and disciples to visit their elders, teachers and guides in order to show respect to them with gifts of coconuts, flowers and sweets. At Vyas, on the Kathmandu-Pokhara highway, Maharishi Vyas, the saint who wrote the great Hindu epic the Mahabharat, gets special treatment. For Buddhists, the occasion (Dilla Punhi) is sacred as the day when the Buddha-to-be entered the womb of Queen Mayadevi. 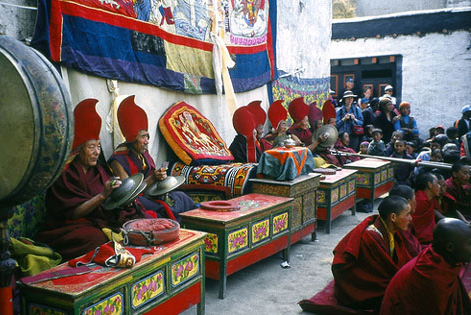 Religious functions are held at monasteries and temples to commemorate the event. Late July or early August; on the commemoration of the battle between a naga and Garur the stone image of Garur at Changu Narayan (Kathmandu Valley) is said to perspire and priests are sent to wipe the perspiration off with a handkerchief. Nagas (cobra gods) are venerated, their pictures hung over doorways and food (rice, milk, honey) put in the fields for snakes to eat. This may be best observed in Bhaktapur. Late July; a biannual festival in which Newar Buddhist priests visit each house and receive a small offering of grain or rice. The Newar decorate their shops and houses with pictures and flowers and the women sit with large baskets of rice and grain to dispense to the priests. (Kathmandu Valley). Late July or early August; the people of Kathmandu Valley celebrate victory over the evil demon Ghanta Karna (bell-ears), who used to rob, kidnap and murder children. The festival celebrates Ghanta Karna’s destruction when a god, disguised as a frog, lured him into a deep well where the people stoned him to death. An effigy of Ghanta Karna is burnt and evil is cleansed from the land for another year. 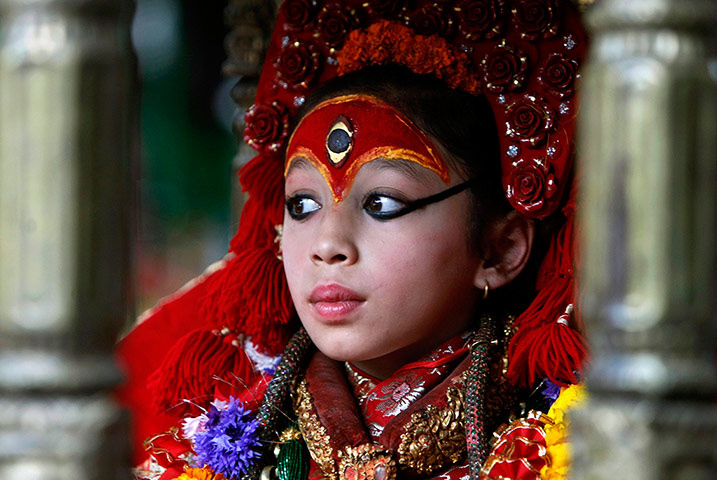 The festival is a relic of ancient demonolatry in the Kathmandu Valley. August; at the full moon high caste Hindu men change the sacred thread thrown over their left shoulders and Buddhists bathe in sacred streams and visit their temples. Nepalese people enjoy this festival, eating a special food, kwati, a soup of 7 different sprouting grains. Special places for this are the Kumbeshwar Temple, Patan or, if you’re trekking, Gosainkunda. August; Gunla is celebrated by the Buddhists of the Kathmandu Valley to give thanks for the monsoon season. It’s a time for prayer, fasting, meditation and religious music. Devotees climb to Swayambhunath where prayers begin before dawn. Important Buddhist statues, oil lamps, prayer flags and scroll paintings are displayed in the monasteries. Late August, or early September, and Holy Cow — it’s Gai Jatra! Satire, jokes, fancy costumes and colourful processions prevail, while those who have lost loved ones pray that the cows will guide their departed souls to the gates of another world. Young men wear women’s saris, children dress up as cows and whimsical characters of all sorts fill the streets. This is probably best seen in Bhaktapur (Kathmandu Valley). Late August or early September; a sort of Nepali Father’s Day. Many people go to the Shiva temple in Gokarna, Kathmandu. Three days after Gokarna Aunsi it’s Teej. Day 1: Women tog up in their finest red wedding saris and celebrate with singing and dancing. Married women visit their father’s homes, daughters and sisters receive gifts from their male kin and an elaborate feast is prepared for them. On the 2nd day the ladies have to fast for 24 hours (phew! ), but continue to tog up, sing and dance (phew again!). It is a loud and cheerful celebration until late night, when fasting discontinues. On the 3rd day, Rishi Panchami, women pay homage to various deities and bathe with red mud. This act of purification is the final ritual, after which women are considered absolved from all their sins, will not suffer from worms and all future births will be happy! So, ladies, here’s your chance to deal with those beastly parasites. The Newar normally celebrate this festival on just the 3rd day. Immediately after Rishi Panchami it’s Gannesh’s birthday and his image, made out of tumeric, sindhoor or cow dung, is worshipped. A fast is observed during the day time, followed by feasting in the evening, and an offering made from sesame seeds is distributed to his devotees. Late August; the second version of the biannual festival in which Newar Buddhist priests visit each house and receive a small offering of grain or rice. The Newar decorate their shops and houses with pictures and flowers and the women sit with large baskets of rice and grain to dispense to the priests. (Kathmandu Valley). Late August or September; impressive ceremonies take place at the Krishna Temple in Patan and Changu Narayan Temple to celebrate Krishna’s birthday. (Kathmandu Valley). Late September sees perhaps the biggest street party of them all, actually 2 as Indra Jatra and Kumari Jatra overlap. 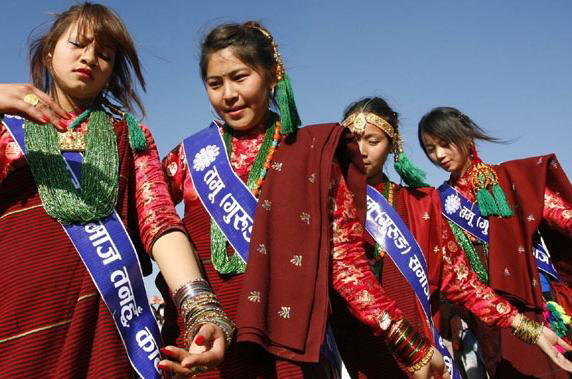 Yenya is celebrated for 8 days in Kathmandu Durbar with singing, dancing and rejoicing. On the 1st day Indra’s flag is raised and masks and statues representing Vishnu, Bhairava and Shiva are shown to the public. At around 5pm a procession of chanting pilgrims winds its way around the historic city centre. 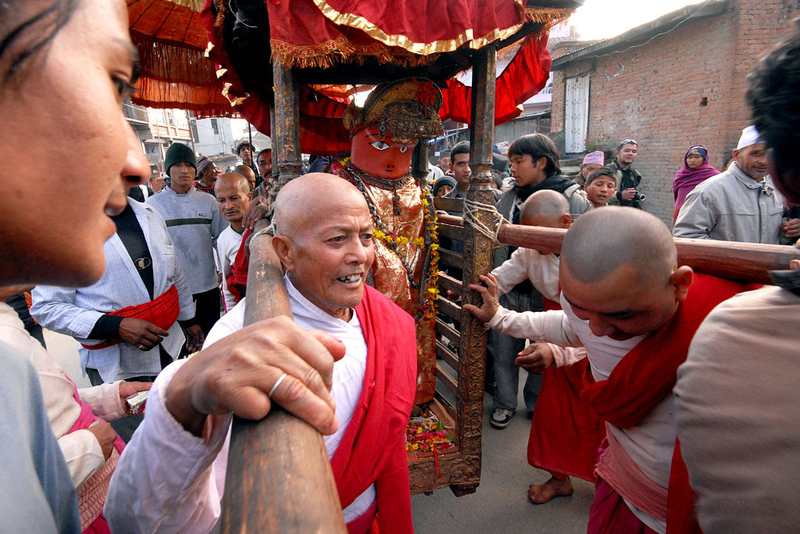 On the 2nd, 3rd and 4th days chariots carrying the Living Goddess Kumari and human representations of Ganesh and Bhairava are dragged through the main streets of Kathmandu. On Day 2, a butter-lamp procession, Mata Biye, is made for Newars to celebrate the dead and honour their friends and relatives. 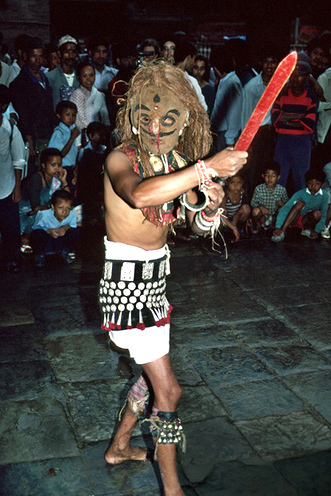 Additional processions include Dagin, when a man wearing a mask accompanied by a musical band, reenacts Indra‘s mother’s search for her son, and which is directly followed by Bau Mata, when a long snake made of reeds is suspended from a pole and carried along the procession route. 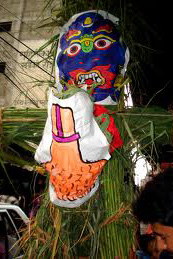 Masks are displayed throughout the festival and demonic dances performed in many places. Late September or early October; animals are sacrificed to this bloodthirsty deity. Late September or early October; Dasain is the longest (15 days) and most popular festival in Nepal. The skies are filled with kites and the marketplaces with farmers bringing their buffaloes, goats and chickens to sell before their sacrifice on the 8th night or 9th day. On the 10th day everyone puts on new clothes and goes to honour their family elders, where they receive large red tikas on their foreheads. In the following days families and friends unite, gorge on feasts, bless each other and give presents. The most important days are the 1st, 7th, 8th, 9th and 10th. On the 15th day people like to gamble. Caveat; most businesses and all government offices close for this period, as do banks etc. Transport can be limited and hotels closed — a bit like Christmas in the West — it’s a family affair. Tourist hubs operate normally. Late October or early November; the festival of light. Day 1; crows are honoured by offerings of sweets and dishes on the roof of the houses. Day 2; dogs are honoured by offerings of garlands, tikka and other special food. The 5-day holiday of Tihar peaks on the 3rd day, Deepawali; in the morning cows are honoured, but in the new moon evening lights and lamps are lit nationwide and girls dance their way round houses collecting dosh. (Gambling is permitted for 3 days and nights and some Nepalis are known to make extreme losses, such as their wives). 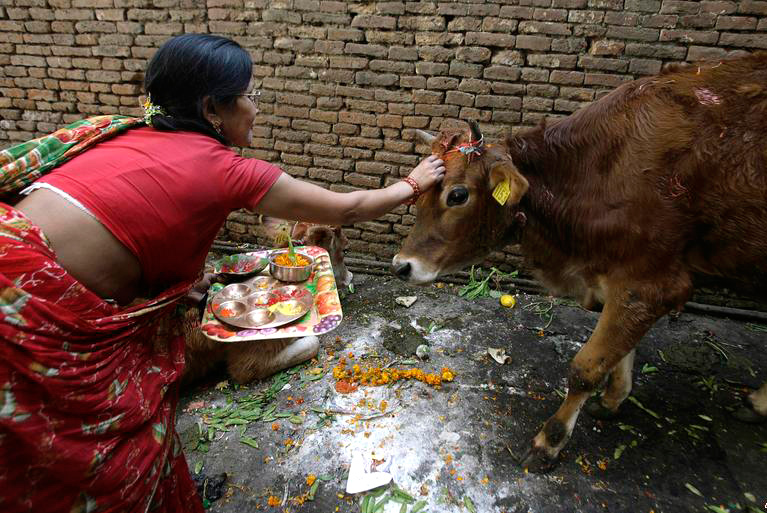 Day 4; oxen and cow dung are honoured, this day is also the start of the Newar New Year. Day 5; sisters give their brothers sweets etc and plant tikas on their foreheads, whilst their brothers give them money or small presents in return. In late October or early November Vishnu wakes up after a 4 month kip through the monsoon and, after 4 months of special prayers, carefully nurtured seedlings are transplanted to larger pots or planted outside. This is accompanied by religious rites and traditionally undertaken by men. On this day of fasting the basil plant is married to the Shaligram, a fossil found in the Kali Gandaki River. Three days later devotees offer 1,000 basil leaves to a sacred river or water. A special puja (religious ritual) is held at Changu Narayan in the Kathmandu Valley though the festival is probably best at Budhanilkantha, also in the Kathmandu Valley. Immediately following the above is a harvest festival with sacrifices and dancing. Late October or early November; Mani Rimdu is celebrated at the Tengboche Monastery in the Everest region. Lamas and Sherpas gather at the monastery for 5 days ‘for the good of the world’. There are masked plays and dances, prayers and feasts, demons are quelled and the pious rewarded. This festival is very colourful. November; surviving (literally) women who have spent a month fasting and drinking only water (phew!) at Pashupatinath spend the evening rejoicing (singing and dancing) — you bet! Late November or early December; a simple festival in which families who have lost a loved one in the last year keep an all-night vigil in the forest, lighting oil lamps and singing songs. Following a ritual morning bath they then walk through the forest scattering 7 types of grain along the paths and over the linga of Lord Shiva to give merit to their late kinsfolk and to help them on their way to the afterlife. Sadhus flock to Pashupatinath and to Maratika Cave, Khotang, Eastern Nepal. Late November or early December; this festival commemorates the marriage of Sita to Ram and attracts thousands of piligrims from India to Janaki Temple in Janakpur in the Eastern Terai. The first full moon between mid-November and mid-December; traditionally, Limbus celebrate Chasok Tangnam at home with the first harvest being offered to Yuma, their ancestor goddess, and other deities. The festival wasn’t celebrated in a social group until recently. It is widely believed that any harvest eaten without first performing Chasok is cursed with misfortune. Other Kirat groups celebrate their own version of this harvest festival at the same time as the Limbus. As the rice crop is gathered in December farmers give thanks for the harvest during Yomari Punhi, when a special cake, yomari, is offered to the gods. 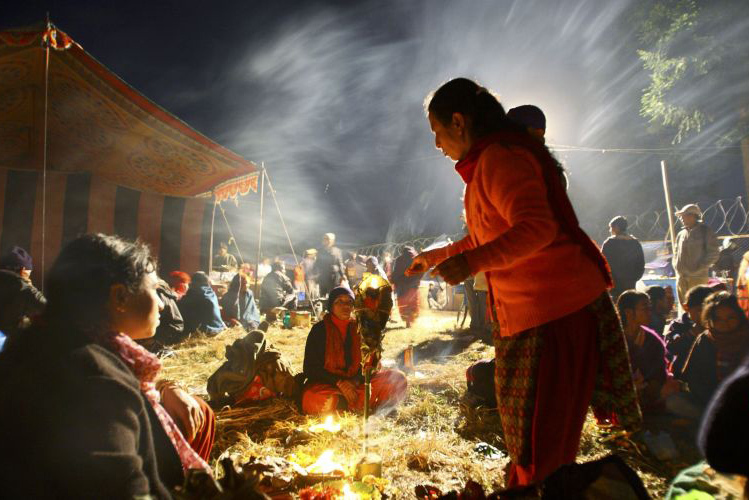 The Tamu New Year falls in late December (around about the 23rd) and is celebrated nationally, especially by Gurung people. This Lhosar lasts 15 days, though the first 3 are the most important with offerings and prayers to the gods, while people gather in traditional costumes to feast on bread and pickles. This is followed by raksi (millet or rice spirit) drinking followed by more raksi drinking. This is a national holiday in Nepal and is increasingly celebrated. In Nepal the most auspicious times of year for weddings are mid-January to mid-March, mid-April to mid-May and mid-November to mid-December. Mid-May to mid-July and mid-August to mid-September are also good. No-one gets married between mid-December and mid-January. The best months for trade fairs are December and January. If you’ve read this far you’ll have realized that there are a lot of festivals in Nepal. The biggest problem is the lunar cycle dating and the confusion this can cause for tourists. In addition there are a large amount of rural festivals not annotated on this list. Have fun.